The BNA recognises, promotes and supports neuroscientific excellence via a number of prize schemes. Read below for full details and past prize winners. This is the most prestigious of the BNA's awards. 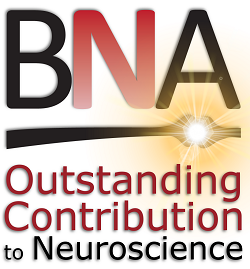 Any member of the BNA can make a nomination for the BNA Outstanding Contribution to Neuroscience Award. Candidates need not be members of the BNA, but nominations must be made and supported by BNA members. Nominations should be sent by email to office@bna.org.uk by 31st October each year. These should make a case for why the nominee should be recognised for their work in neuroscience. If you have any questions please contact the BNA office. Emeritus Professor of Biology, Open University. Emeritus Professor of Phsick, Gresham College London. Visiting Professor, University College London. 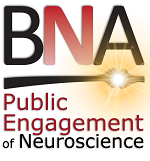 Any member of the BNA can make a nomination for the BNA award for public engagement. Candidates need not be members of the BNA, but nominations must be made and supported by BNA members. Nominations should be sent by email to office@bna.org.uk by 31st October each year. These should make a case for why the nominee should be recognised for their work, in any capacity, in the field of public engagement in neuroscience. Cardiff University. Health and Care Research Wales Fellow working in the Neuroscience and Mental Health Research Institute (NMHRI). Fellowship focusing on computerised cognitive training (brain training) for people with Huntington's disease. Dedicated STEM ambassador and role model who was awarded the prestigious Charles Darwin Lecture at the 2018 British Science Festival. University of Cambridge. Neuroscience coordinator who supports neuroscientists across the institution through activities including conferences and seminars. Significant contributor to BRAINfest public event in 2017. University of Bristol. A full time neuroscientist who is also highly active in carrying out public engagement, and in facilitating other people to do so via the Bristol Neuroscience Festival. University College London. TV and radio presenter, director of Cheltenham Science Festival. Fiona Fox, Chief Executive and Dr Edward Sykes, Senior Press Manager and Head of Mental Health & Neuroscience. Each year, the BNA awards an undergraduate (£250) and a postgraduate (£500) prize to student BNA members. Our prize winners often, if not always, go on to be highly successful in their chosen fields, playing a leading role in neuroscience. Applicants for both postgraduate and undergraduate prizes must be current BNA members. All nominations should be sent by email to office@bna.org.uk by 31st October each year. We encourage you to nominate your students! The specific requirements for applicants can be found under the 'For members' section of the website. Please get in touch with any questions.